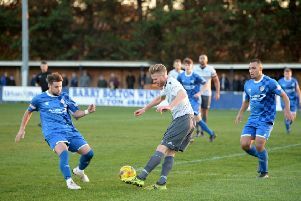 Crawley Green held on to draw 1-1 against Baldock Town on Saturday in a game which saw assistant manager Craig Meyrick have to go in goal during the second half. The visitors had the better of the opening 20 minutes, but with the addition of Alex Bennett on Tuesday, Green kept things tight. Sam Pemberton was called upon to clear off the line from Lewis Barker, who then had a header saved by Dean Bull. The Maroons keeper denied Owen Robertson twice, as Crawley tried to reply, Scott Sinclair off target. Green finally got on the front foot, Phil Draycott testing Adam Harpur in the Baldock goal, who also saved from Mark Bunker. 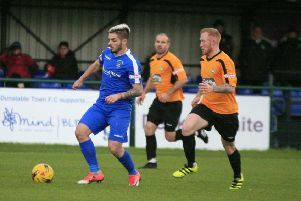 The hosts then took the lead on 36 minutes, when Billy Lobjoit cut in from the left and with his weaker right foot curled over Harpur to make it 1-0. In the second half, Phil Draycott’s free kick was saved by Harpur, but Baldock then broke quickly, Kieran Barnes missing a good chance. However, they were level on the hour as Owen Robertson bent an excellent effort beyond Bull. Lobjoit and Steve Redmond both had shots saved by Harpur, with Redmond clearing Barker’s header off the line and Barnes putting a free header wide. Late on, Bull injured his groin taking a goal kick and had to be replaced by Meyrick, who made a brave stop to prevent a late winner.